Court costumes. Nobility in France and Germany. Home » Court costumes. Nobility in France and Germany. Court costumes. France and Germany. Fashion in the first third of the 18th century in France and Germany. Transition from Baroque to Rococo. Nobility and Court costumes. Upper half of the picture: French Abbé and gentlewoman. Lord and Lady of the court of Louis XIV. Lower half of the picture: German gentleman and lady. French gentleman and lady. 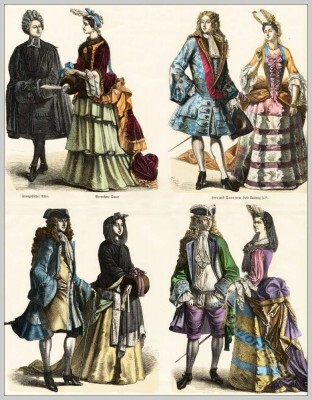 Source: On the history of costumes”. Munich pictures sheets. Published by Braun & Schneider, Munich c.1858 -1898s. This entry was posted in 1724, 18th Century, Ancien Régime, Court dress, France, Germany, Hairstyle, Headdresses, Nobility, Shoes and tagged Allonge wig, Baroque era, Cul de Paris, On the history of costumes, Rococo fashion on 9/9/13 by world4.